Refer to product label for warnings and indications. Use only as directed. Although no withdrawal is required, we recommend you follow the NPPC voluntary 14-day withdrawal period for all products containing tetracyclines. 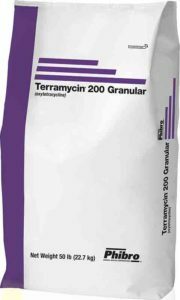 Terramycin is a broad-spectrum anti-infective that has been proven effective against a wide variety of infectious diseases caused by susceptible Gram-positive and Gram-negative bacteria.The anti-infective is safe, stable and highly effective; it works in both the respiratory and in the gastrointestinal tract. Terramycin can be combined with Mecadox®. This combination provides excellent protection against both respiratory and enteric disease challenges. Certain products and formulations displayed on this site may not be approved for use in all countries. Please check with your local Phibro representative for use restrictions and product safety and/or warning information required in your area.